A view of the interior with the molded and painted frog and salamander. These cups or mugs are commonly referred to as "frog mugs". 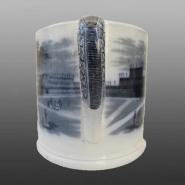 A view of the side of the cup revealing the printed handle. A loving cup printed in black with a view of the Crystal Palace conservatory designed by Sir Joseph Paxton for the Great Exhibition of 1851. The Crystal Palace was a cast-iron and plate-glass structure originally erected in Hyde Park, London, to house the first British international exhibition of industrial goods from many nations. 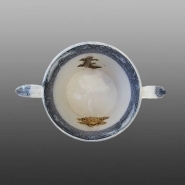 The interior border design of the cup includes musical and agricultural accoutrements. Included in the interior are a molded and painted frog and salamander or newt. The size is not known.